I teach electric, bass, and acoustic guitar in a modern clean studio and use the RGT courses as a guide. My courses are tailored to suit your particular interests and musical tastes and cover all ages and abilities and are aimed at getting you playing what you want to play as well as developing a good understanding of the instrument. I will always back any music theory up by showing it on the guitar and can provide professional quality backing tracks for any new scales or techniques to be tried with. My teaching studio is equipped with recording and sequencing equipment so you can hear yourself playing or record your compositions if you wish. I am currently based in Hunmanby so am well placed for Filey, Scarborough,Malton, Bridlington and surrounding areas. Amplification is provided and I can also provide a cup of coffee and a biscuit if required. I have a full enhanced DBS check and am also fully insured. Please feel free to contact me with any questions you may have or to book a lesson. I’m interested in your 5 lessons deal for my husbands Christmas present. 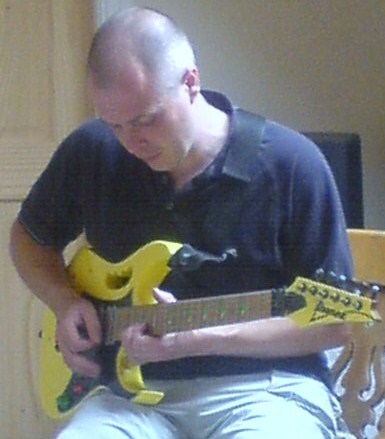 He played years ago and still has his guitars but says he would need lessons to play again. Thing is he works away during the week so is only free on the weekend. Yes, Weekends no problem, I teach Monday to Saturday. Yes I do one to one and I can travel sometimes.